Spotting Orca at sunset around Northern Vancouver Island in British Columbia, Canada is one of the most incredible sights you will ever come across. After seeing Orca on a whale watching trip on the waters off Northern Vancouver Island in British Columbia, Canada, the day comes to a perfect ending with a magnificent sunset. The rows of different colors throughout the sky at sunset over this small island makes this moment ideal for an outstanding photo. A calm afternoon on a whale watching trip around Northern Vancouver Island in British Columbia, Canada can give you a better opportunity to listen for Orca whales as there seems to be less boat traffic on the water later in the day. In addition to the quietness of these waters you also have the chance of seeing a spectacular sunset such as this one. 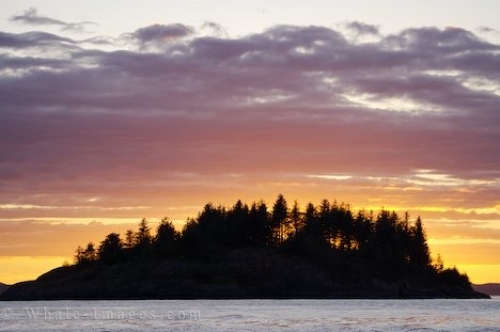 ... are plenty of kayaking trips available around Northern Vancouver Island in British Columbia, Canada where you can camp overnight on an island and hopefully odds are on your side of seeing an Orca or two pass by in the solitude of Mother Nature.